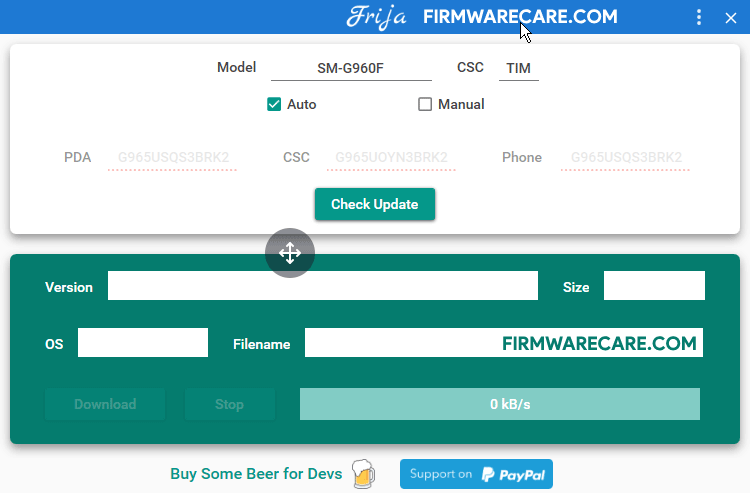 Frija v1.1.0.0 is a small application for windows computer created by GSM Frija, which allows you to download the stock firmware (flash file rom) of your Samsung device. Sometimes, it happens when you’ve tried out different firmwares in your device in order to gain administrator privileges, run special applications, run custom ROMs or free internal storage on your samsung device, but now have decided to revert back to official firmware by Samsung like it was exactly when your bought your device. In that case, Frija v1.1.0.0 is a very useful tool to revert all the changes made to your device back to original. The tool is an easy solution if you’re upgrading and selling your current device. Since, it is an open source tool. You may use it free for always. In order to use the Frija Tool, you need to install the Universal ADB Driver on your computer. [*] Compatibility: The Frija Tool runs perfectly on Windows XP, Windows Vista, Windows 7, Windows 8, Windows 8.1 and Windows 10 (32 bit and 64 bit). [*] Credits: Frija Tool is created and distributed by GSM Frija (developer). So, full credits goes to GSM Frija (developer) for sharing the tool for free.